Behind all the administration’s bluster of keeping out terrorists and protecting the homeland through President Donald Trump’s executive order temporarily blocking people from seven Muslim-majority nations from entering the United States, is the fact that innocent people—college students, teachers, athletes, mothers, and children—are most harmed by the cruel and heartless policy. Trump signed the order last week, barring citizens of Iraq, Syria, Iran, Libya, Somalia, Sudan, and Yemen from entering this country for 90 days. Additionally, the order stopped all refugees from coming for 120 days and indefinitely stopped entry by refugees from Syria. The poorly planned and administered White House decree caused confusion among immigration officials at international airports and spurred massive protests against the policy. For the moment, the new administration has been stymied and a dollop of sanity prevails in the wake of the national response to the Muslim and refugee ban. At the end of last week, federal Judge James Robart of the U.S. District Court for the Western District of Washington suspended key parts of the executive order nationwide. That triggered an administration request for the travel ban’s reinstatement to the Ninth Circuit Court of Appeals in San Francisco, which, as I write, is preparing to decide on the legality of Judge Robart’s suspension of the presidential order. Without doubt, the legal wrangling will ultimately be decided at the Supreme Court. Meanwhile, real people’s lives hang in the balance. My colleagues with CAP’s Immigration Policy team have collected reports of individuals’ and families’ stories of struggle and sacrifice, to inject some humanity into the dry paperwork and arcane legal arguments that dominate the politics and policy talk behind the Muslim and refugee ban. Sara, 31, a former television presenter told The New York Times that she fled to Indonesia after receiving death threats in Afghanistan. The Taliban, who were likely behind these death threats believe Afghan women have no role in public, let alone on television. Before Trump issued his travel ban, Sara had been waiting for more than three years to receive a visa to the United States. Now, she continues to live in limbo. An unnamed Yazidi refugee from Iraq told The Guardian that she was waiting at the departure gate to board her flight to the United States when the world turned upside down on her. Dr. Suha Abushamma, 26, is an internal medicine resident at the Cleveland Clinic. Although she had an H-1B visa for workers in “specialty occupations,” which should allow her to enter, live, and work in the United States, Abushamma was not permitted to enter the country. Abushamma holds a passport from Sudan, which is one of the banned nations. 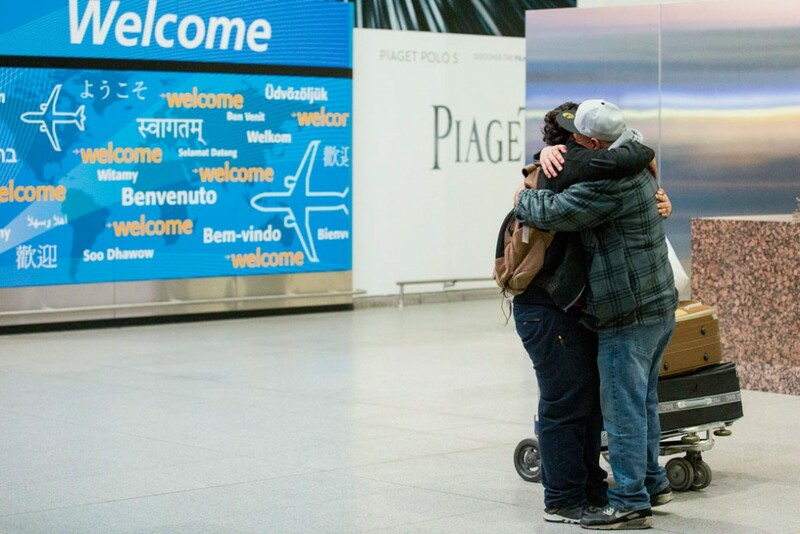 At the airport, customs agents gave her two choices: leave voluntarily and immediately, withdrawing her visa, or be forcibly deported, which would prevented her re-entry for at least five years and blemish her previously spotless immigration record. Abushamma chose the first option and, just hours after arriving in New York, she was forced to board another plane and return to Saudi Arabia, where she was born and raised. Sahar Algonaimi, 60, was detained for five hours at Chicago O’Hare International Airport following the issuance of the executive order. Algonaimi, a Syrian national, had traveled to the United States from Saudi Arabia to visit her 76-year-old mother who is recovering from surgery for breast cancer. Although she held a U.S. visa and had planned to stay in the country for a week, she was she was forced to board a flight to the United Arab Emirates instead of being allowed to clear customs. Algonaimi’s sister, Nour Ulayyet, a U.S. citizen who now lives in India, spoke to The Huffington Post about the effect of her sister’s experience. As these stories make crystal clear, there’s a human dimension to the policy choices that a nation makes. Indeed, there are hundreds, if not thousands, more stories like these. This nation should never allow such a policy by blindly following a mantra of fear. Trump’s executive order refuses to recognize the immorality of decisions that don’t make us safer but only breeds hostility at home and abroad. There can be no other option than to resist this heartless and inhumane immigration policy.